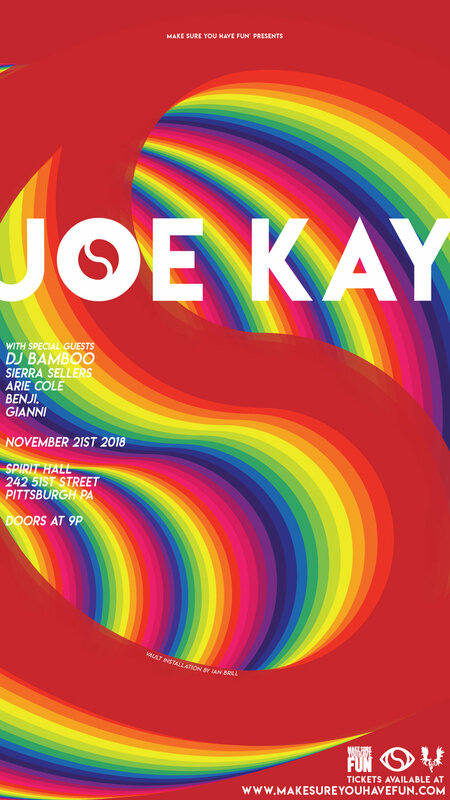 On Black Wednesday (day before Thanksgiving) 11.21.18 Make Sure You Have Fun™ is bringing Soulection & Beats 1's own Joe Kay for his first ever performance in Pittsburgh, PA underneath Ian Brill's Vault Installation (CLICK HERE TO VIEW) . Catch him alongside Pittsburgh premiere DJs DJ Bamboo & Arie Cole with LIVE performances from singer/songwriter Sierra Sellers & artist/instrumentalist Benji. Joe Kay is the co-founder of radio show, music label and artist collective, Soulection. In 2018 alone Joe Kay will have played over 40 US cities including New York, San Francisco, Miami, Nashville and Washington DC in addition to over 15 European locations in Paris, New Amsterdam, Porto, Dublin & Barcelona on 3 separate tours.